I was up early today so that I could shower and walk Mix and still have plenty of time to drive to Alloa to attend Sang’s Church this morning. Sang worked with me in Luss and I am very fond of him and also of his parents who are across in Scotland for a very few days. 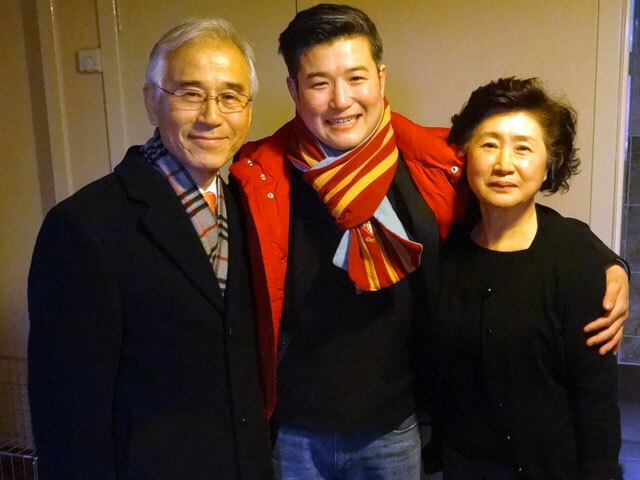 It hasn’t been a happy trip entirely because Sang’s great friend Rosemary died and Sang’s Mum and Dad had made the journey to Great Britain to attend the funeral with Sang. I know that it meant a great deal to Sang that they did. And so this morning I wanted to go to be with Sang as he conducted his morning service – Rachel would have liked to have been with me but today in Gavinton is our new minister’s first Sunday and she wanted to be present for that. In the event she was there on her own as Mum has a bad cold and Tom and Dorothy were also away with their grandson. I arrived early in Alloa (I am always early) and so I explored a bit and discovered that Alloa really is quite a big place. I got a good welcome at the church door. Did I have a communion ticket? No? Well I could have one, and having been issued with it, it was promptly taken from me! I sat with Sang’s Mum and Dad and after the service (which included as well as the Sacrament of Holy Communion, the ordination and induction of seven new elders) we were joined by Sang’s colleague Sarah and all walked to Wetherspoon’s where we had a very pleasant meal in a crowded restaurant – well it was Mother’s Day. I had eggs, ham and chips; it couldn’t have been better. I discovered that my path had crossed with Sarah’s before. When Dad was at Glamis, Sarah was a nine year old lass in the Sunday School, and I went to preach at Glasgow Cathedral on Sarah’s first Sunday as probationer assistant. She had been left in charge of the cathedral due to the minister’s ill health. She is now in Castlemilk and is the mistress of Annie, one of Rowan’s sisters. I enjoyed meeting her again. It was really good to see how well Sang is doing. He is clearly loved by his congregation, is working hard and is reaping the rewards of that effort. After eating we went back to Sang’s manse where I saw Ella, Rowan’s Mum and already heavily pregnant again. Soon I was back in the car and driving home, arriving after an uneventful journey about half-past six. I spent a while getting organised, changing out of my suit and having a couple of tea cakes by the fire with Rachel, delivering some roses to Mum for Mother’s Day, and then Olive, Mum, Rachel and I watched Mr. Selfridge before the News, walking Mix and retiring to bed. It had been another good day.